Every once in a while you come across something that you know is special, unique and so well made that you don’t ever forget it. I came across Earthbound Journals while perusing my local favorite bookstore. The day I stumbled upon the beautiful handmade journals I came to know, I was in a browse mode and planned to come back for the specific purpose of purchasing one of the journals I did see. As it turned out when I did return, the journals had sold out. They were restocked shortly thereafter but in the interim I made contact with Bill Palizzolo to ask about his amazing journals and explore more of the fine handcrafted creations available. The Journals I did see on display had great texture and detail. 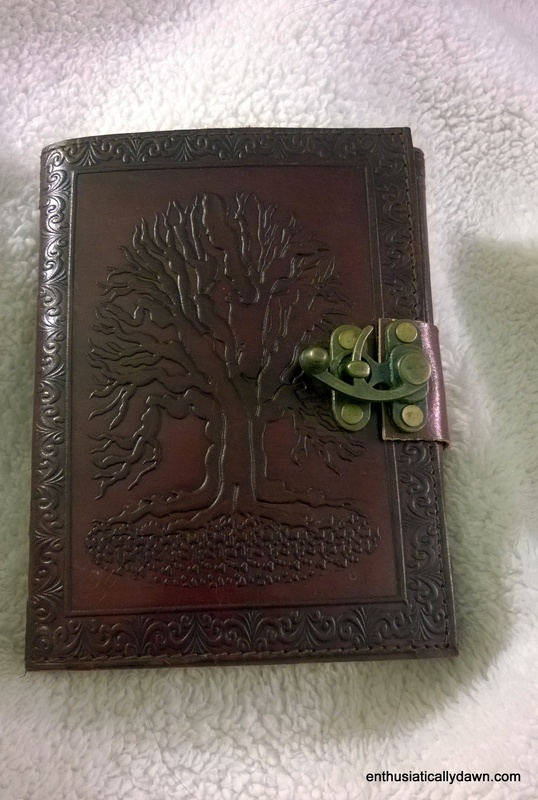 I was drawn to the Tree of Life and happily received the journal for review purposes. Since first discovering the Earthbound line there have been new additions such as the Kaleidoscope journals which come in four sizes ( I look forward to seeing these in person soon!) and are available in six colors, ranging from five to thirty-nine dollars. The Tree of Life sketch book looks like an excellent size for those who need a bit more room for their creative work. I like that a number of different sizes are available that seem non-standard to me. The Tell-Tale journal, which features a heart on the cover is definitely calling my journaling heart next! The paper is linen -cotton parchment paper. It feels incredible in quality and I found that as I wrote on it, it created a unique writing experience. I know this will sound strange but the way the ink flowed on the paper made me want to write! It also made me want to slow down. There is something about the handmade aspect and heirloom quality of the journal that causes one to want to savor the writing experience (or sketching perhaps- I am not a sketchy type so I can only speak from a writerly perspective!). I generally write fast and furious. Often I am trying to capture my thoughts …but this journal lends itself well to enhance the quality of one’s journaling session. The hand bound coptic laced binding allow for the journal to lie flat while one draws, writes, or sketches. It also preserve the integrity and beauty of the journal over time. The Binding also adds to the beauty and overall presentation of the journal itself, making it a great gift journal. Just as those who will express themselves uniquely on the pages of these notebooks, the journals are created one at a time. By artisans for artisans and all those who would endeavor to journal, doodle, or leave a bit of themselves on paper. Be sure and check out the brand new, improved website where you can explore these journals as well as the bags available. I also did a Preview video on You Tube (Pardon my very bad allergies during filming). If you have any questions OR if you want to tell me which journal was your favorite at Bill’s site just let me know in the comments. My, my they are lovely, but I’d have to save up cash for one of the 5 1/2 x 9 in.! Normally, I buy sketch books as my journals (I hate lines! ), in Barnes & Noble bookstores– $ 13.00 or less. These journals/sketch books, whatever…they are gorgeous!! Love them…if I bought one of these beautiful journals, I’d have to write ONLY very special things in it…not my quickly scribbled or written words – that I read back over later and find misspelled words!! Oh, well!! Thanks for sharing these beautiful journals…I do need a new one? !